Lanka Children’s and Youth Theatre Foundation (LCYTF) will present Colombo Theatre Festival for Young Adults 2010 for the fifth time under the theme of ‘Theatre for Education and Reconciliation’. The LCYTF, or better known as Play House Kotte, was established as a voluntary organization in 1981 by Somalatha Subasinghe with a view to promote in particular children’s and youth theatre and mainstream theatre in Sri Lanka. The objective of the Colombo Theatre Festival for Young Adults is to provide a platform in particular for young theatre directors to showcase their productions in particular to the youth generation to enhance their awareness on modern theatre Arts. On the other hand, the festival will also be a valuable opportunity for the public to experience theatre with meaningful entertainment both in the categories of original creations and adaptations from the international theatre. Festival organizers are presenting three stage plays for this year’s festival. They are Vikurthi (Distortion) by Somalatha Subasinghe, Gladiator Premaya (Gladiator Love) by Namal Jayasinghe and Prasanna Mahagamage and Sanda Langa Maranaya (Blood Wedding) by Kaushalya Fernando. 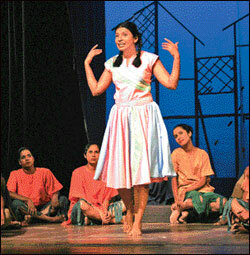 Sanda Langa Maranaya adjudged the Best Play of the year at the National Drama Festival 2005. Vikurthi has been one of the most popular stage plays in produced in early 1980s and Gladiator Premaya is the latest theatrical endeavor by the Play House Kotte. It was acclaimed by theatre critiques. All plays are with deep-insights into the socio-cultural issues faced particularly by the youth. The organizers of the festival wish to inform the public that the tickets are priced at affordable rates with very generous assistance provided by HNB Assurance PLC. Vikurthi is a satirical exposure of hapless generation of youth whose lives were dominated by incessant struggle between the parents’ aspirations and the youth’s abilities and preferences. In the 1980’s, at the time the drama was conceived, the widespread social tendency was that the aspiring parents trying to achieve the missed opportunities of their own lives through their children. Consequently the children were forced to study for competitive government examinations specifically in the science Stream disregarding their aptitudes and available resources at respective schools and the universities. The play discusses in depth how this anti-social process denied youth of their own life, which in turn deeply affects them in many ways. The production is a semi-musical which is a familiar theatrical experience to the local audiences. The professional theatre group of the Play House Kotte has performed Vikurhti in English in major cities of India and Australia in 2000. The play is received well by the foreign audiences. Vikurthi cast includes Kaushalya Fernando, Namal Jayasinghe, Prasannajith Abeysuriya, Geetha Alahakoon, Mayura Kanchana, Pujitha de Mel, Sanjaya Hettiarachchi, Nimmi Priyadharshini, Wickrama Seneviratne, Sulochana Weerasinghe, Dilum Buddhika Perera and a number of newcomers to the national theatre groomed at Play House Kotte. The play is written and directed by Somalatha Subasinghe. M R Chulasinghe composed music for the play. Choreography is by Somalatha Subasinghe and Chandana Aluthge. Stage lighting is by Chandana Aluthge and make-up is by Priyantha Disanayake. Gladiator Premaya (Gladiator Love) is created by the youth theatre artistes who have successfully completed the Diploma Program in Drama and Theatre conducted by Kaushalya Fernando in 2009. The Diploma program entails all round training such as acting, script writing and analysis, directing, movement and vocal training. Over 25 years, the LCYTF has been training numerous talented youth who are at present engaged in the work of both theatre and film industry at professional level in Sri Lanka. Gladiator Premaya was premiered in January 2010 at Lumbini. The story line and the script of the play have been developed by the young theatre artistes, who have completed the training in Drama and Theatre arts at LCYTF. Development of the script was done under the supervision of Namal Jayasinghe. Namal was the chief resource person of the scriptwriting and analysis section of the diploma program. 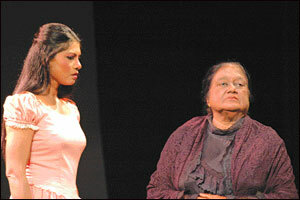 Gladiator Premaya is based on certain Sri Lankan contemporary social issues. They are dramatized on stage to bring forth the youth point of view of the issues. The play is co-directed by Prasanna Mahagamage and Namal Jayasinghe. Prasanna works with Kaushalya on Acting, Directing and Movements sections of the diploma program. Both Namal and Prasanna joined Play House Kotte in 1997 and obtained their training in theatre arts at LCYTF. Gladiator Premaya cast includes Wishvajith Gunasekera, Sampath Chaminda Jayaweera, Priyantha Siri Kumara, Kalana Gunasekera, Nadishani Weliwita, Harsha Thennekoon, Sulochana weerasinghe, Nadishani Padmasiri, Geetha Alahakoon, Mayura Kanchana, Nilanka Dahanayake, Dilip Kumara. Costume Designed by Namal Jayasighe and Prasanna Mahagamage, Stage sets designed by Namal Jayasighe and Prasanna Mahagamage, Stage Lighting designed by Chandana Aluthge, Stage management is by Isuru Kashyapa and Lahiru Nimantha. Production Manager is Thilina Perera. Make-up is by Priyantha Disanayake. The play is co-directed by prasanna Mahagamage and Namal Jayasinghe. Kaushalya Fernando and Chandana Aluthge are executive producers of the play. Sanda Langa Maranaya is the Sinhala version of Garcia Lorca’s Blood Wedding. Blood Wedding, one of the famous trilogy based upon Spanish society, written by Federico Garcia Lorca in response to a news paper article concerning a local murder in rural Spain. The story of the play is a triangle of passionate love among a bridegroom, a married man, and a young bride. The play basically is a tragedy of missed love, focusing certain universal themes such as extremism, intolerance, and inflexibility in society which makes it relevant for all times. The production is a semi-musical-surrealistic-type which is a familiar theatrical experience to the local audiences. The choreographed movements, music and rhythm, and vivid lighting and colours in addition to very intense acting on stage impart an entertaining yet intense theatre encounter. Sanda Langa Maranaya was adjudged the best play of the year at National Drama Festival in 2005. It won eight awards in total at the festival for different categories. Sanda Langa Maranaya cast includes Kaushalya Fernando, Sampatha Chaminda Jayaweera, Lucian Bulathsinghala, Sulochana Weerasinghe, Mayura Kanchana, Nadee Kammallaweera, Lakmini Seneviratne, Sanjaya Hettiarachchi, Pramode Edirisinghe, Nayomi Gunasiri, Palitha Abeyratne, Geetha Alahakoon, Dinuki de Silva, Dasun Pathirana and a number of new comers to the national theatre groomed at Play House-Kotte. Nadeeka Guruge composed music for the play. Choreography and stage lighting are by Chandana Aluthge. Stage sets and properties are by Namal Jayasinghe while make-up is by Priyantha Disanayake. Stage management is by Aruna Jayasena.